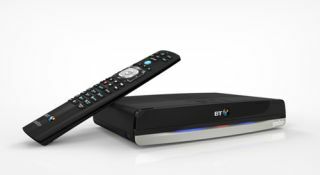 BT launches "smaller and sleeker" YouView+ box | What Hi-Fi? BT has launched a "smaller and sleeker" version of its YouView+ box, which features a design that brings it into line with other BT devices, such as the Home Hub 4 and Hub 5 internet routers. The set top box has been reduced in size because it doesn't need a fan, while other benefits of the new device include faster start-up time and smoother TV guide/on-demand menu navigation. New BT TV customers who take out a subscription from £5 per month and pay a £35 activation fee will be able to get the smaller YouView+ box, while existing customers can upgrade for £35. More than 100 TV and 20 radio channels can be received by the new box, including Freeview HD. The 500GB hard drive can store up to 300 hours of SD TV or 125 hours of HD TV recordings. Other features of the new YouView+ box include a seven-day electronic programme guide; remote recording via the YouView app; and the ability to record up to two channels at once. Alex Green, director of BT TV, said: "The new YouView+ box from BT has all the functions and features that viewers love about the service, but it’s even better. "The new YouView+ box from BT has been designed in the style of other BT devices, so will look great in any living room."